Losing loved one is the most difficult as well as emotional times in anyone’s life. During such remorse situations, both friends and family of the deceased gather to bid a final goodbye. Flowers have been an essential part of the funeral services since ancient times. Depending on the location, season, and the relationship with the deceased you can send flowers for a funeral ceremony to express your love and respect for the deceased. However, you must choose the appropriate sympathy flower arrangements in Brooklyn. 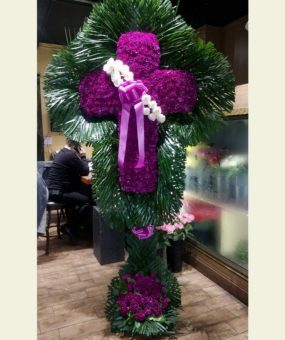 We, at Floral & Fantasy, offer various floral arrangements for a funeral service, and custom flower arrangements as well. The following are the popular funeral flowers that are appropriate for expressing sympathy. The best funeral flowers are those that represent some meaning and symbolism. To learn more about these flowers read below. Lilies – Lilies have been associated with funeral long ago. They are usually used for sad occasions like the death of a loved one. Lily symbolizes innocence, and according to Christianity, the Virgin Mary’s tomb was covered with lilies. Therefore, lilies represent peaceful sleep and returning of innocence. Carnations – Red carnations signify love and admiration, so they are one of the most suitable flowers for expressing sympathy. White carnations are a symbol of innocence, whereas the deep red carnations represent passion. Chrysanthemums – When it comes to flower arrangements for a funeral service, different parts of the world have different traditions depending on the availability of flowers, and other factors. In Pacific Asian countries like Korea, China, and Japan, white chrysanthemums are considered a symbol of mourning and grief. On the other hand, in Europe, they’re mostly associated with death. Daffodils – Daffodils are usually associated with rebirth and spring, therefore, making a great choice to celebrate a life instead of lament a death. Gladioli – Gladioli are tall and upstanding, they represent integrity and remembrance. If your loved one was a judge, police officer, or lawyer, Gladioli make the right choice. Roses – With the availability of a variety of colors and soothing scents, roses can be used in a various way to make a personalized funeral arrangement. Tulips – Another funeral flower that has a wide range of colors and is appropriate to express sympathy is a tulip. Red tulips are associated with a declaration of love, whereas tulips of other colors symbolize grace. Orchids – Orchids make the best choice as funeral flowers for a female loved one. Orchids are usually associated with celebrating proud femininity and thoughtfulness. Lastly, the death of the loved one can be extremely difficult situation. Therefore, by sending funeral flowers to the deceased’s family home, you can express your condolence and support. Do you need floral arrangements in Brooklyn? Contact us – Floral Fantasy – (718)-238-6978. We are the leading dealer of funeral arrangements in Brooklyn.